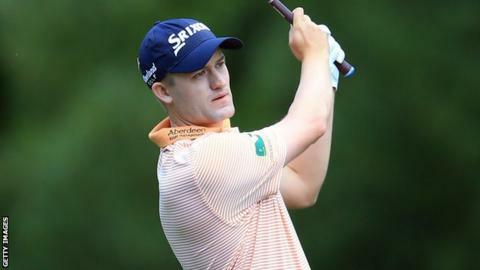 Russell Knox was left cursing two triple bogeys in two days on his maiden Masters as he missed the halfway cut along with fellow Scot Sandy Lyle. Knox, 30, improved on his opening 79 with a one-over par 73, while 1988 champion Lyle, 58, struggled with an 81 after his opening 76 at Augusta. "Two triple bogeys over two days is hopeless," said Knox on Twitter. "It's too difficult to recover from. "But I am going to remember everything from the week." America's defending champion Jordan Speith takes a one-shot lead into the third round. He's four under par, with Northern Ireland's Rory McIlroy one back on three under. With strong winds affecting those playing later in the day, last year's winner needed one more shot than Knox following his flawless 66 on Thursday. And Knox said: "Heading to the first tee, the goal was just to play well and, if something great happened, if we could get under par early and get some momentum, just to try to play better. "A turkey [three consecutive birdies] on the back nine helped keep the last holes entertaining and, if I made two bogeys in the holes I tripled, we would have had a great chance to make the cut." Playing with Danny Lee and Smylie Kaufman, Knox said of the duo: "Those guys played excellent and I wish them the best. "I am jealous that they are going to have two more days walking round the National." Lyle double-bogeyed the par-three fourth and dropped three shots at the ninth, failing to make a single birdie over his two rounds. And he said on Twitter: "Frustrated! played well @TheMasters but putting #windy #tricky #fast"
The cut mark was six over par, with Phil Mickelson, Zach Johnson and Rickie Fowler notable names among those going home early.